Although you cannot yet sign up for the Espeem service, you can get an idea of the planned features in this short explainer video. Have you ever felt that you have spoken plainly to a partner about a material only to realize that you don't exactly mean the same thing? This is really common when industrialists, experimentalists, and modelers communicate. I think the first step to bridging the gap is to become aware of the communication challenge - something I started thinking about when I within two weeks attended the Europe Materials Modeling Council workshop on interoperability and the Future of Materials Summit in Luxembourg. Illustration: By Mads Engelund: Remix of work by Guillaume Baffou, Taner Yildirim, Michael Schmid and cdu445 under CC-BY-SA-3.0. If you want to keep up-to-date with the latest developments in the SPM field these are some of the conferences that will introduce you to the latest developments in the field. The list is arranged starting with the conferences that are narrowest in scope and ending with the most general. TERS - International Conference on Tip-Enhanced Raman Spectroscopy is an annual conference on this more-and-more popular topic. Last held, Washington, US, August 2017. SPM-on-SPM - International Conference on Scanning Probe Microscopy on Soft and Polymeric Matter(SPM-on-SPM) is a bi-annual conference on, well, SPM as applied to soft matter. Last held, Changchun, China, 2016. 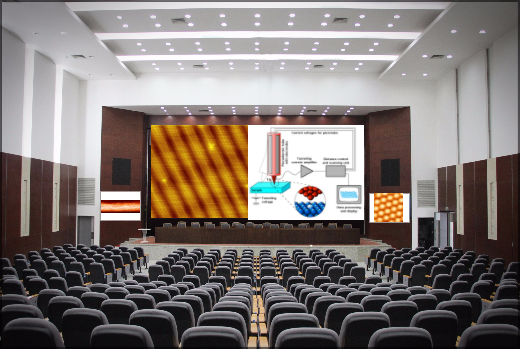 NC-AFM - International Conference on Non-Contact Atomic Force Microscopy is an annual conference. Next event, Suzhou, China, September 2017. FyT - Fuerzas y Tunel has a surprisingly international feel for a national conference. Talks are in English, and international guests are welcome. The conference is bi-annual and moves between cities in Spain. Last held, Girona 2016. ISPM - International Scanning Probe Microscopy Conference is an annual conference covering the full spectrum of SPM. Last held Kyoto, Japan, 2017.
mmc-SPM - Microscience Microscopy Congress - Scanning Probe Microscopy is an annual meeting occurring in the UK. The SPM meeting occurs during the larger microscopy conference. Last held, Manchester, UK, July 2017. ECME - European Conference on Molecular Electronics. Biannual conference (odd years) on molecular electronics covering molecular electronics from basic physics to commercialization. Last held, Dresden, Germany, September 2017. ACSIN - International Conference on Atomically Controlled Surfaces, Interfaces and Nanostructures. Last held Italy, Rome, October 2016. Next held Sendai, Japan, 2018. ECOSS - European Conference on Surface Science. Annual conference on all aspects of surface science. Last held Szeged, Hungary, September 2017. MRS Meeting - Materials Research Society Meetings are held twice a year and collect a wide range of researchers of from every discipline needed to understand materials. Broad in scope, but there are SPM-focused sessions. Held next in Boston, US, December 2017.